The addresses of about 100 people in Seberang Perai, Penang were digitally changed on their MyKad without their consent, claimed several Pakatan Harapan activists. This discovery was made by Seberang Perai Municipal Council members Satees Muniandy, David Marshel and PKR election coordinator Ong Eu Leong after visiting several residential areas last week. "These individuals never went to the National Registration Department (NRD) to have their addresses changed. So how did this happen? "What is their intention of doing this? Is it to manipulate voters data for the coming general election? We believe their voting areas have also been changed and if this is true, it is a crime and the authorities must investigate," Satees told Malaysiakini. He said that although the address written on the MyKad was not changed, running the MyKad chip through card readers showed that their address on NRD records were altered. This would complicate efforts to check the integrity of the voters' registry, which was already difficult because the Election Commission has refused to supply political parties with digital copies of the voters' list. 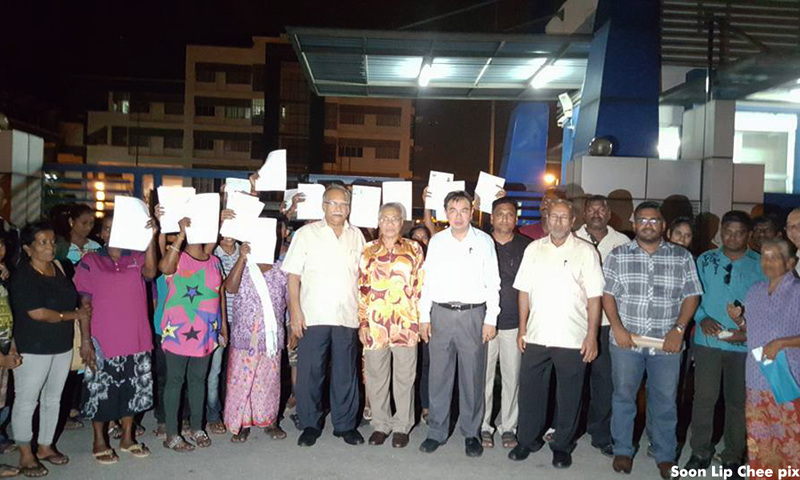 It is understood that at least 29 affected voters have lodged police reports on the matter. When contacted, Seberang Perai Selatan police chief Supt Shafee And Samad said police has contacted the NRD and will wait for their response before taking further action. When approached today, a Penang NRD front desk officer said the department's officials were not available for comment as they were all at a briefing. According to one of the police reports, the complainant claimed that she was visited by a woman at her home in Sungai Bakap on June 16 who requested to read her MyKad through an electronic device for the purpose of obtaining financial aid from the government. The complainant said that she complied because she believed that the visitor was a bona fide government agent out to help her. "However, when I checked my details on the MyKad reader, my address in the NRD system has been changed to an address in Prai, I know nothing about it," said the complainant. "I never had any intention to change my address, and I had never been to the area where my address had been changed to, and I never visited the NRD for the purpose of changing my address." Prai town is about 30km away from Sungai Bakap. Marshel said the details in the police report and other anecdotal evidence would suggest that there was a syndicate out to deceive the voters into changing their addresses. "People were told that they would get hampers or be eligible for lucky draws when their MyKads were taken away for four days. When the cards were returned, they were not given the things they were promised," he said. He accused an Indian-based BN-friendly political party of being behind the syndicate. Attempts to reach the leader of the party's Penang chapter has been unsuccessful. According to Satees, Marshel and Ong, most victims of the syndicate were of Indian origin. For Ong, this was a case of déjà vu because there was a similar scheme being run prior to the 2013 general election. At the time, the affected areas were Batu Maung, Sungai Acheh, Seberang Jaya and Sungai Bakap. "Last night, we managed to trace another 35 voters who were transferred to another constituency. The modus operandi has not changed since 2013," he said. Ong said that he and his Harapan colleagues will continue their investigations and house visits until they uncover the truth.